Linus Torvalds confirms the date of first Linux kernel release. 25 years ago, on August 25, 1991 Linus Torvalds announced the kernel he was working on. That kernel later became Linux. August 25th is celebrated as the birthday of Linux. But the interesting fact is that August 25 is not the date when Linux was released. In an interview during LinuxCon North America (Toronto), Torvalds told me that the first release of Linux (version 0.01) was never announced publicly. He uploaded it to an FTP server and sent an email about it to people who showed interest in it. When I asked about the date for the first release, he said that didn’t remember the date as he lost all the emails about it. Later, during a keynote discussion with Dirk Hohndel (VP and chief open source officer of VMware) at LinuxCon, he said that the only way to find the date is by finding the tarball of the first release and check the time-stamp. Today is the 25th anniversary of the Linux-0.01 release, I do believe. Normally, the anniversary is counted from the announcement email (August 25), because that was the actual public statement of intent. The 0.01 code drop happened a couple of weeks later, and wasn't publicly announced. I noticed something interesting. There is mention of FREAKS-Kernel. 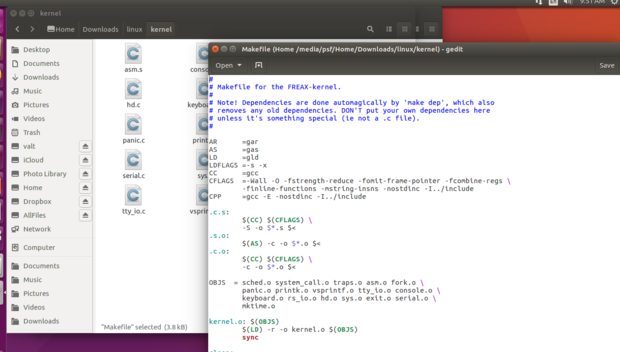 Those who don’t know, Torvalds originally named his kernel ‘Freaks’ - a mix of ‘free’, ‘ freak’ and UNIX. But when his coworker uploaded the kernel to the FTP site, he didn’t like the name and renamed it to Linux, without asking Torvalds. 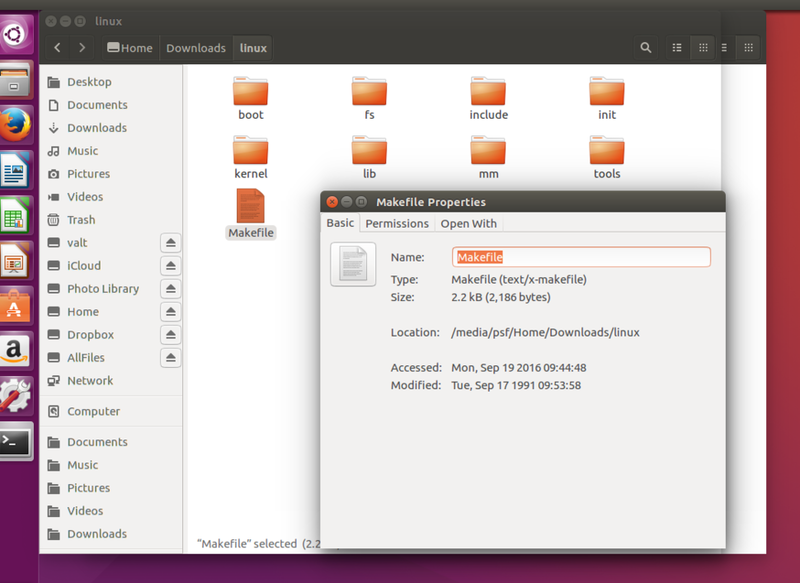 If you check the makefile for the kernel, you will still find the FREAKX name here. Mention of FREAKS-kernel in the makefile of the first release. Initially Linux was released under a non-GPL licence, restricting any commercial use of the kernel. In 1992, Torvalds changed the licence to GNU GPL v2, removing the commercial restriction. The Linux copyright will change: I've had a couple of requests to make it compatible with the GNU copyleft, removing the "you may not distribute it for money" condition. I agree. I propose that the copyright be changed so that it confirms to GNU - pending approval of the persons who have helped write code. I assume this is going to be no problem for anybody: If you have grievances ("I wrote that code assuming the copyright would stay the same") mail me. Otherwise The GNU copyleft takes effect as of the first of February. If you do not know the gist of the GNU copyright - read it. Torvalds credits GPL v2 for the success of Linux. During his keynote discussion with Hohndel, Torvalds said, “What made the difference was the license. "FSF [Free Software Foundation] and I don't have a loving relationship, but I love GPL v2," said Torvalds. "I really think the license has been one of the defining factors in the success of Linux because it enforced that you have to give back, which meant that the fragmentation has never been something that has been viable from a technical standpoint." While Torvalds credits GPL v2 and the Linux community for the success of the project, Linux has become the most successful GPLed software in the world, emerging as a great success story of copyleft code. Simultaneously, Linux also changed the way companies develop software. Linux made companies comfortable with open source. Even companies like Microsoft are now open sourcing their existing technologies such as PowerShell and .NET framework. AI and Machine Learning are seen as the 4th industrial revolution and companies like Amazon, Microsoft and Google have already open sourced their machine learning technologies that are building the foundation of AI. We can all thank Linux and Torvalds for it.